Hope you all had a Joyous Diwali with your family n friends...! And enjoyed the delicious array of lipsmacking Sweets & crunchy munchy snacks...!! 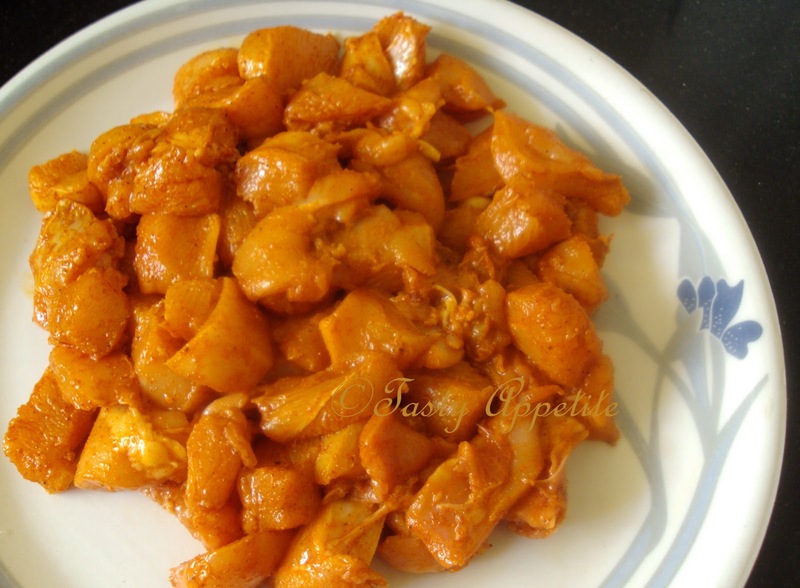 Now we would relish yet another popular Indian recipe, that we all love - BUTTER CHICKEN. 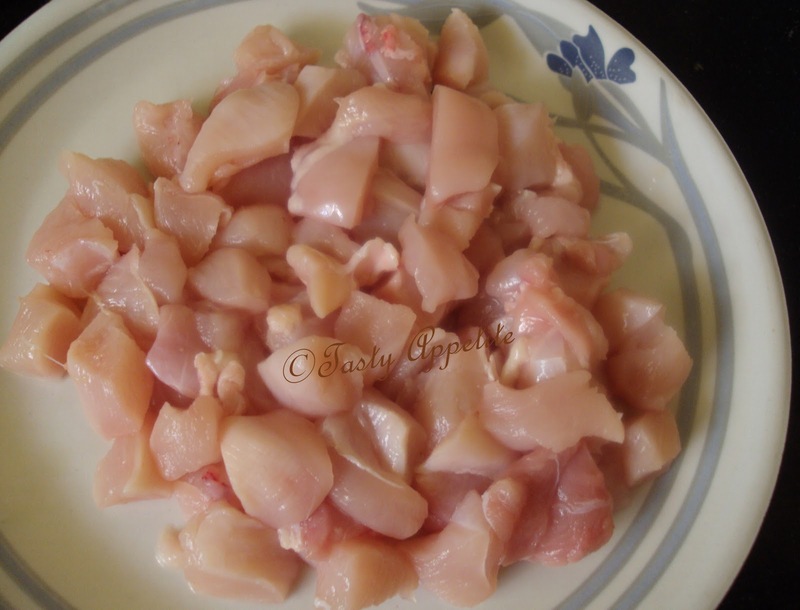 It is a favorite special of all non-veg lovers. This quick to prepare gravy, can be made hot or mild, as we like it, so it suits most palates. In this recipe, the boneless chicken ( Murgh ) is marinated in spices and cooked in Butter ( Makhan). Its delicious and juicy taste will make our taste buds go crazy..! Cook the chicken covered on medium flame. Add finely chopped onions and chopped ginger garlic, green chilly and sauté till golden brown. Add all the spice pwd, tomato paste, combine and turn off the flame. Grind in a mixer to smooth paste. Add this paste to hot butter. If needed add little water and cook it. The gravy should be perfect, not too thick or too thin. Now add cooked chicken pieces. Add fresh cream, and stir. I used Amul’s cream and it gave rich aroma. Now add yoghurd, give a quick stir and turn off the flame. Garnish with some cream, chopped coriander leaves. Enjoy hot with rotis, naan and chapathi...! Looks great! 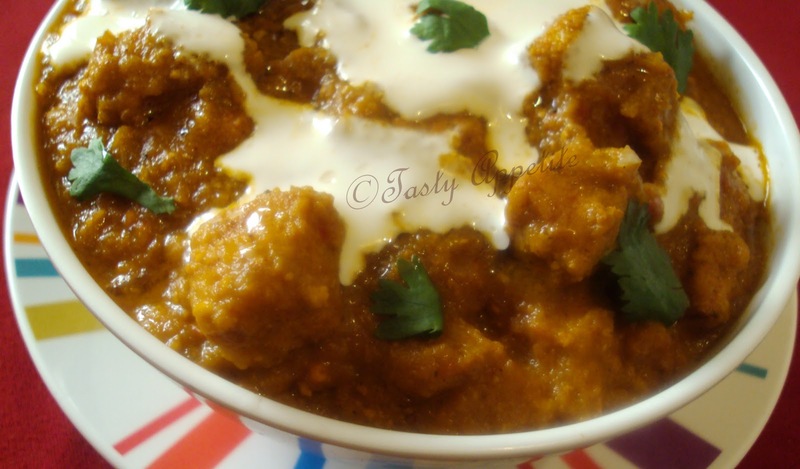 I also make a butter chicken but substitute sour cream for the heavy cream to reduce the fat! Hi..Happy Deepavali Jay, hope you've had a joyful celebration with all your families...So sorry for the late wishes...Just came back from holidays *___*. Btw, your butter chicken looks tempting and awesome dear..
What a mouth-watering dish! Love the combination as all the ingredients are my fave :) Enjoy your weekend, Jay! Thank you so much for choosing to stay a while and sharing our lives through food. I appreciate all your comments, ideas, daily encouragement and support. Love butter chicken! The cream really sends it over the top! i loveeeeeee butter chicken n this is yumm!!! Looks absolutely wonderful, very flavorful dish. This looks delicious. There's a lot of great flavors in that dish! 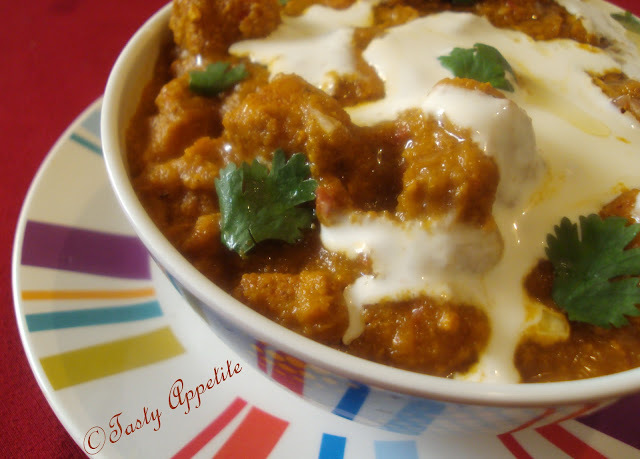 Simply delicious and yummy looking butter chicken. Simply stupendous looking photographs. Typical Classic Jay recipe. Deliciously done with mouthwatering clicks.Luv it. Wish you and all your loved ones a very Happy Diwali! Mouthwatering recipe! Wow, this looks and sounds amazing! 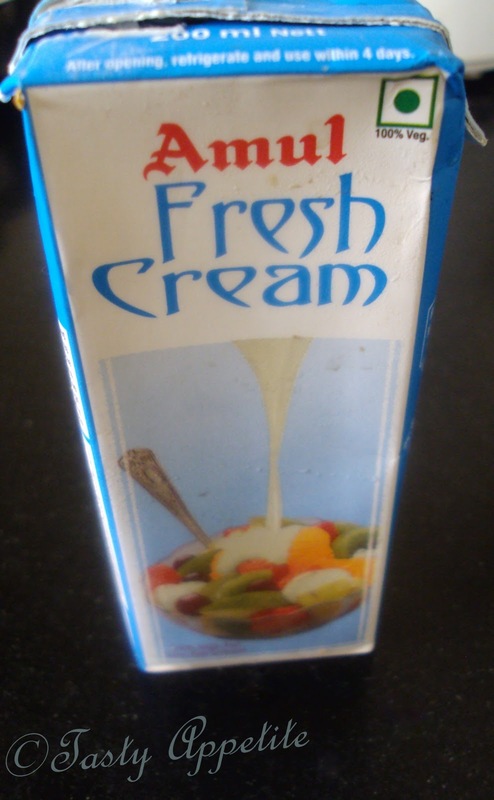 I will have to pay my local India Market a visit and look for a couple of items I don't have on hand. Great blog you have here. Thanks for stopping by and saying hello! 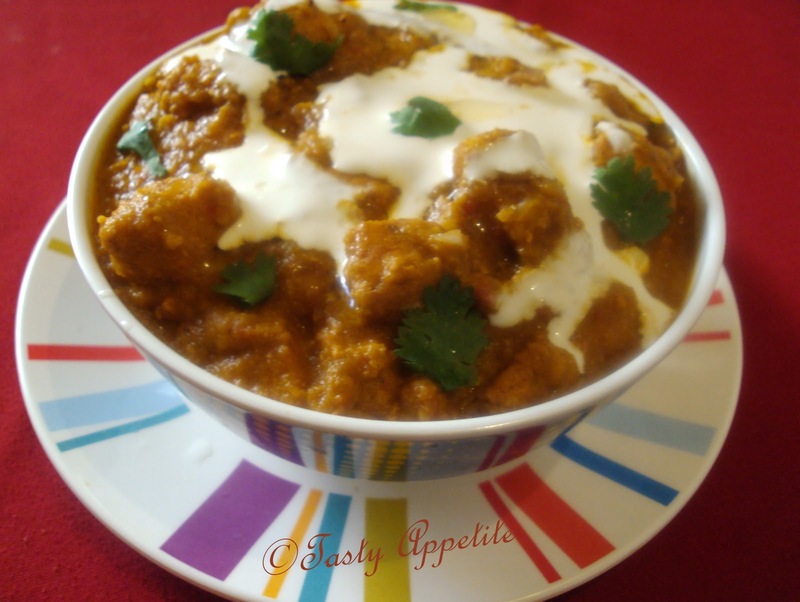 A delicious bowl of murgh makhani. Yummmyy!! mouth watering recipe...looks so yum n delicious ..thanx for the recipe dear !! Looks like true comfort food! And thank you so much for commenting on my blog! Thanks for visiting me! I love your blog and i will be back here. I love this dish!! What a stunning chicken dish and lovely pictures!! My absolute Indian favorite. Thanks for sharing your recipe! Butter and chicken, that's it, I'm sold! Great recipe! This is my fav Jay though I spicy hot more on the heavy side. Made for my friends and they enjoyed it very much. thanks for following me. you have a great blog here! love the butter chicken it looks fantastic. very happy to know tht u tried my recipe!!! !thank u dear!!! Yummmm!!!!! Now I am craving for some butter chicken , this really looks good Jay . And your butter chicken looks absolutely mouth-watering! Looks simply delicious! That looks really good. I'm hungry for butter chicken now. Yumm!! That you posted your sweet comment on my site, must have been à sign, because since we had an Indian curry dish at the daring kitchen I am so addicted to the Indian kitchen, and your recipes look and sounds great. I'm hungry already. 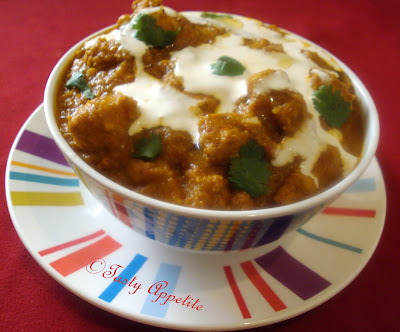 That looks so delicious, I love butter chicken! One of my all time favorite chicken dishes. Yours looks perfect. Thanks for stopping by my blog. Glad to follow you too. Jay, your butter chicken look so good and tempting. yum yum and have a nice day. This sounds really delicious. I've never made butter chicken before but I love your recipe. Thanks for visiting my blog too. This is a dish we see often here in the US. Your recipe sounds fantastic and full of flavor. I love the you drizzle the yogurt overtop the finished dish. Yum! I need to stop at the Indian market at get Fenugreek. It is one Indian spice I don't have in my pantry, but I see it very often. Yup, been thinking about making this dish for ages. Perhaps its time to just do it. After adding yoghurt(step 17)sprinkle the crushed kasuri methi leaves.